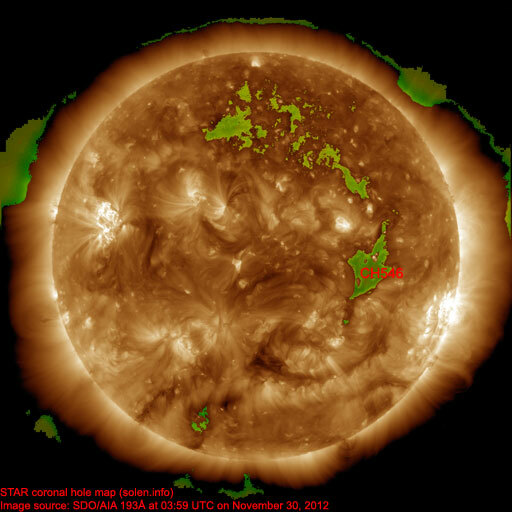 Last major update issued on November 30, 2012 at 04:15 UTC. The geomagnetic field was very quiet on November 29. 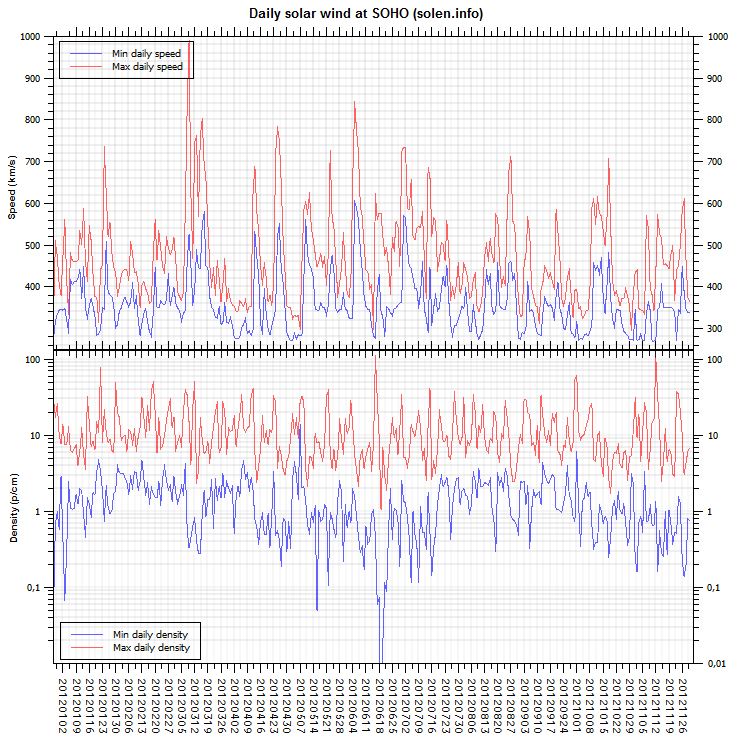 Solar wind speed at SOHO ranged between 339 and 375 km/s. 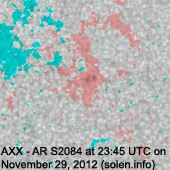 Solar flux measured at 20h UTC on 2.8 GHz was 113.1 (increasing 16.6 over the last solar rotation). 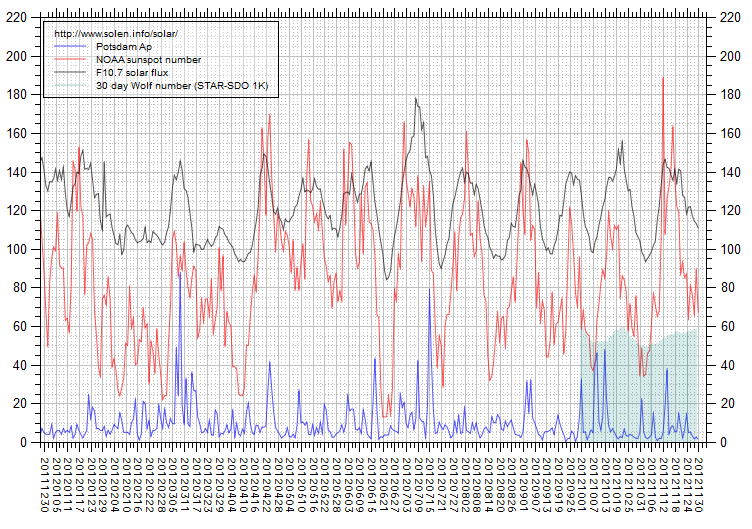 The Potsdam WDC planetary A index was 3 (STAR Ap - based on the mean of three hour interval ap indices: 2.6). 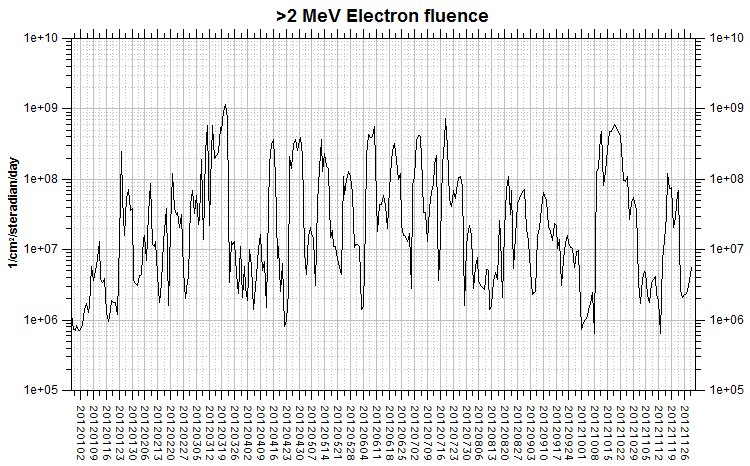 Three hour interval K indices: 00010111 (planetary), 01121211 (Boulder). 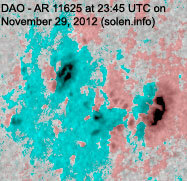 Region 11620 [S13W71] decayed in the trailing and intermediate spot sections and lost the magnetic delta structure. There's still a chance of an M class event as the region rotates to and around the southwest limb. Region 11621 [N15E11] decayed slowly and was quiet. 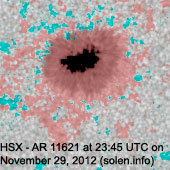 Region 11623 [N08E48] was mostly quiet and displayed little change. 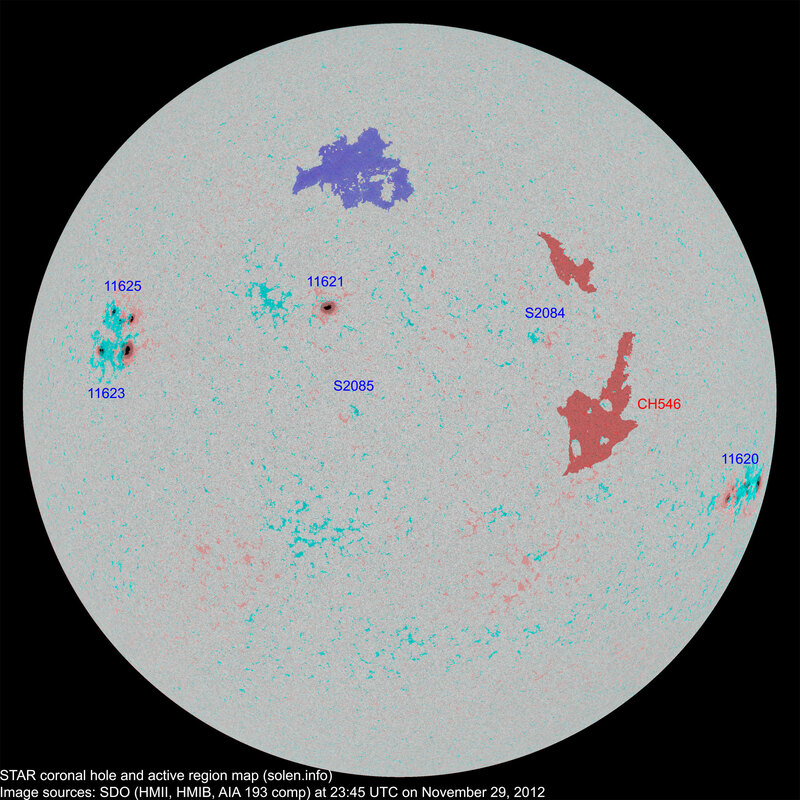 New region 11625 [N13E48] emerged on November 28 and developed further on Nov.29 when it was numbered by SWPC. 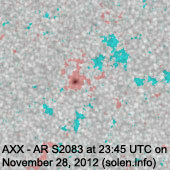 S2084 [N09W23] was quiet and stable. 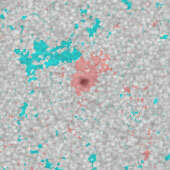 New region S2085 [S02E07] emerged with a tiny spot. 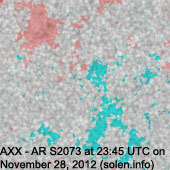 A bipolar reversed polarities region emerged at a high latitude and was located at N70E03 at midnight. No spots have been observed so far. 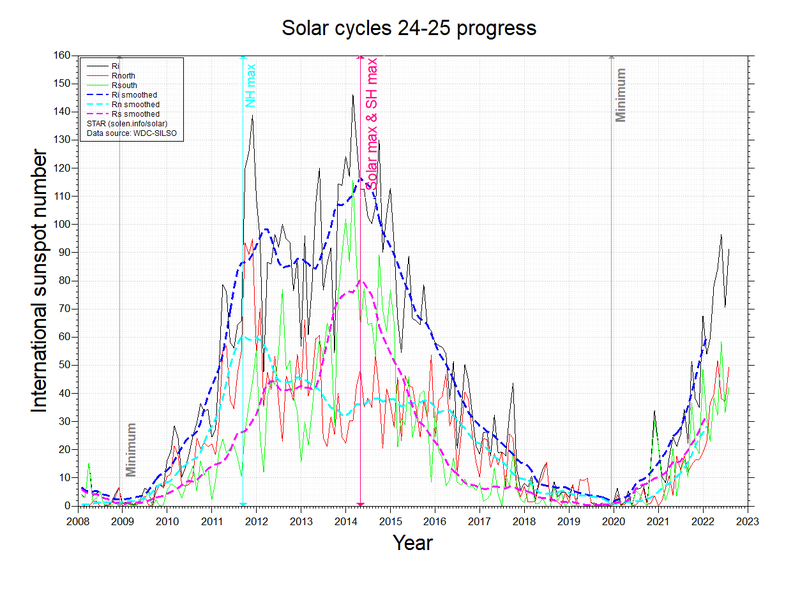 November 28-29: No obviously Earth directed CMEs were observed in LASCO and STEREO imagery. 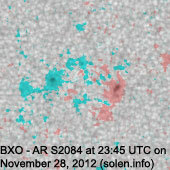 November 27: Several interesting events were observed during the day. 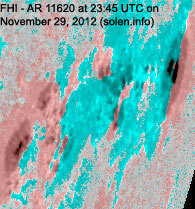 A filament eruption near AR 11621 began just after midnight and was later on associated with a partial halo CME in LASCO imagery. 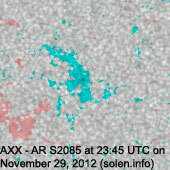 There's a chance this CME could reach Earth on November 30. 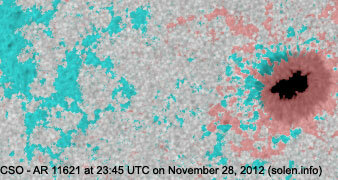 A very slow filament eruption across the equator and mostly in the western hemisphere was observed during the morning. 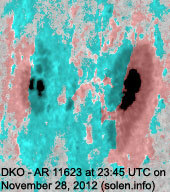 STEREO imagery indicate weak components of the associated CME could be Earth directed. 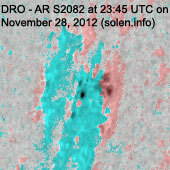 Another filament eruption was observed beginning at 20:45 UTC between AR 11621 and AR S2080, however, the associated CME does not appear to have any Earth directed component. 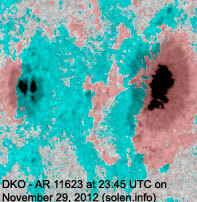 A recurrent trans equatorial coronal hole (CH546) was in an Earth facing position on November 27. The geomagnetic field is expected to be quiet to active on November 30 and December 1 due to a high speed stream from CH546. 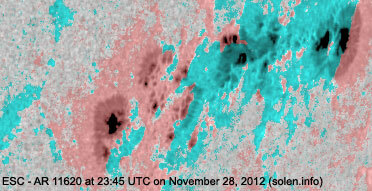 CMEs observed on Nov.27 could contribute to the geomagnetic disturbance as well. Quiet conditions are likely on December 2-3.